There’s very little question that the feral transvestite samurai in Till Kleinert’s student-thesis feature debut is a stand-in for the protagonist’s rampaging id, but everything else about the movie’s symbolism is up for grabs. Kleinert’s demented story of violence and eroticism run amok lends itself to easy pop-psychological translations in some regards, but the dream logic doesn’t map well to real logic. There’s a lot of specificity to this energetic nightmare, but it’s delivered in the language of fairy tales and mythology, and it almost confuses the question of what, if anything, is actually going on. Der Samurai openly operates in an emotional palette rather than a rational one, but it doesn’t need the rational at all. It’s so evocative on an instinctive level that its panting excitement overwhelms the sense of questions unanswered, and often unasked. 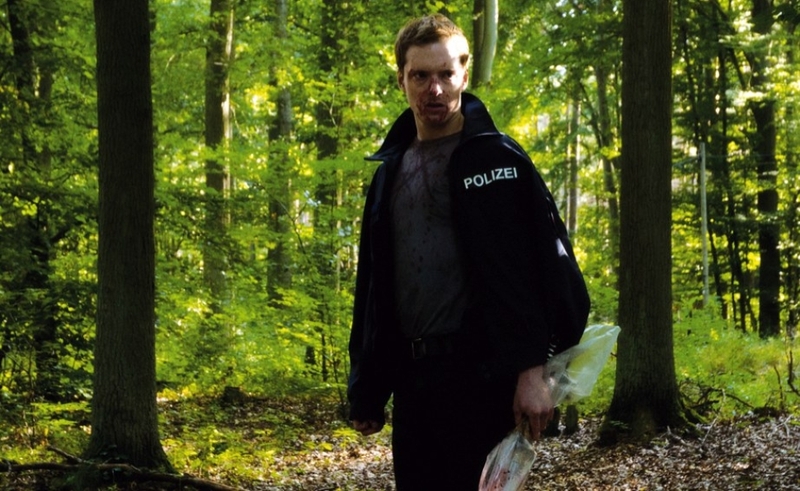 Michel Diercks stars as Jakob, a shy young policeman in a small German town that has little use for him. He’s regarded with suspicion as an outsider, with contempt for his youth, and with condescension for his meekness. From the start, though, it’s clear that the town is as much a folkloric, symbolic medieval village as a modern place: A wild gang of drunken, wolfish bikers (shades of Lost Boys) haunt the town, chuckling at Jakob’s mild attempts to rein them in. An actual wolf is stalking the town, which is surrounded by a deep, mysterious, thoroughly iconic forest. And Jakob, as vanilla as he seems, is going into the woods to feed the wolf bloody gobbets of meat, for his own purposes—when he isn’t sitting at home, meticulously re-creating the town in the form of a miniature model, as if to indicate how small, predictable, and limiting a place it is. Then Jakob gets a katana in the mail, addressed to “the lonely wolf,” and when he investigates the source, he runs across a bloody-mouthed and bloody-minded man in a long white dress. It doesn’t stay white for long. “The Samurai” (Pit Bukowski) murders his way through the town with the katana, but there’s little sense that the killings are significant in a human way. Even the sloppiest modern slasher film tries to turn its cannon fodder into characters, or at least caricatures. The Samurai isn’t killing people so much as he’s evoking the idea of uninhibited wish-fulfillment mayhem, in the form of a swath cut through all the people holding Jakob back. As the two men chase each other around, Kleinert uses the glowing coronas of the town’s lights, the darkness of the woods, and the eerie imagery of the stained white dress to suggest a sort of religious awe. It feels as if the two men—or possibly one man and a werewolf, or one man and his own inner demon—are enacting a sacrificial ritual, but contending over exactly who is going to be sacrificed. Der Samurai isn’t disciplined enough to fully realize the impact Kleinert seems to be going for. It’s narratively messy, with story elements piling up and disappearing, and a movie-long cat-and-mouse chase that drags out like a nightmare, reaching a point where it feels unvaried. The catharsis when it ends is significant, but that doesn’t change the sense of repetition toward the middle. Still, the film has an unbeatable asset in Bukowski, a deeply creepy character actor who reads like the werewolf equivalent to Max Schreck in Nosferatu: He’s such an unsettling presence, he raises the question of whether Kleinert somehow found a supernatural creature to slum it in a film about his species. Bukowski plays his wild-man role without reservation, and his crazed-yet-canny affect throughout is responsible for at least half the sense that all this must be happening in Jakob’s head, because there’s nothing so mundane as an everyday murderer to The Samurai. There’s nothing mundane to this movie at all. A chuckling commentary from Kleinert and producer Linus de Paoli digs into the details of small-town life, non-professional actors, and fairy-tale archetypes that went into constructing the film. And a 10-minute making-of featurette takes an unusual and appealing approach: It shows the various steps involved in assembling the film’s few digitally assisted shots and some of its startling practical effects, but it operates without narration, just using onscreen text and suggestive music to set an intent, focused mood. The resulting piece makes behind-the-scenes material seem almost as dreamlike as the film, instead of puncturing the mood with a prosaic or mundane approach.